returns a new AudioStream object and starts to record from the default input audio device. records from the input audio device inputdev. starts recording an AudioStream object astream that is connected to an input device. AudioRecord can be used to perform programmatic audio capture from any input audio device. The inputdev can be any device available in $AudioInputDevices. With multiple streams connected to the same device, only one stream can record at a given time. 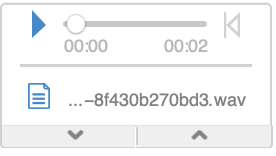 Use AudioPause or AudioStop to pause or stop the recording. Audio[astream] returns an Audio object including all the captured data available in astream. AudioRecord records until the stream is paused or stopped. Use MaxDuration->dur to record for the specified duration dur.